Goa is certainly a good introduction to India for any first-time visitors. 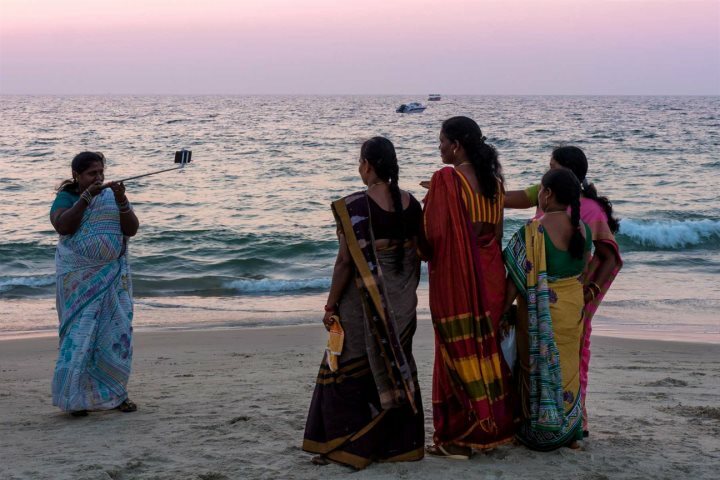 As one of the wealthier Indian states, you aren’t exposed to the abject poverty that I do remember from my tour of India all those years ago, particularly in some of the bigger cities. 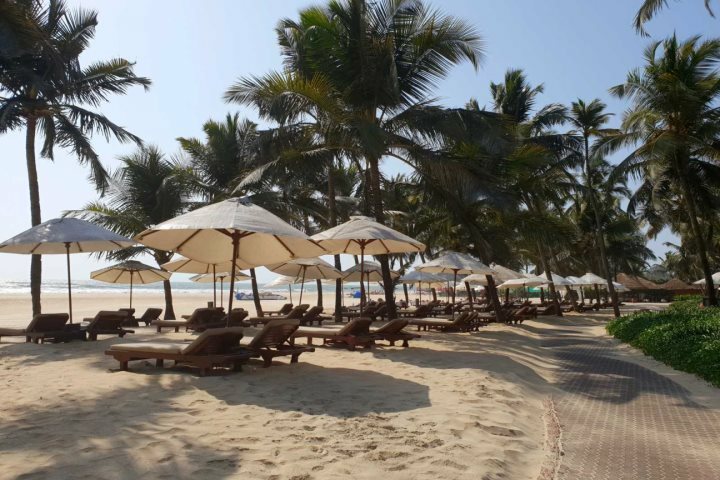 One of the first things you notice about Goa is the colour and vibrancy of the scenery; even after a hot winter season, everywhere is still so green with swaying palm trees, colourful, flowering plants and open fields. 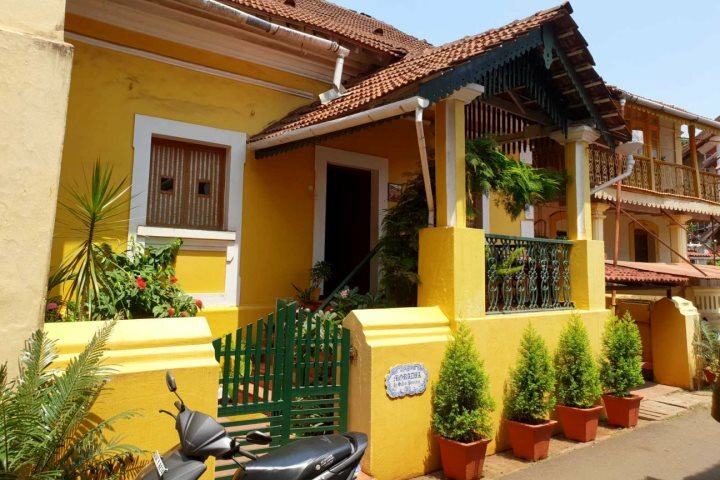 Many of the Portuguese-influenced homes are painted in vivid shades of cerise pink, purple and lime green, shades that would be horrific in your local neighbourhood but somehow seem to fit perfectly in Goa. 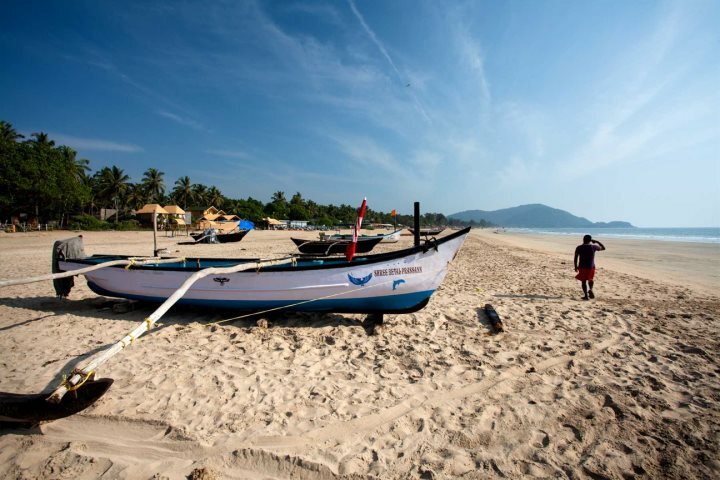 All this colour opens onto some of the most breathtaking beaches; even if you’re not normally a beach person, you should take the time to walk along the powder-white sands of South Goa and dip your toes into the Arabian Sea. We tentatively paddled in the shallows expecting the normal shock of freezing cold water, only to be amazed at how warm and bath-like it was, which then drew us in further to enjoy jumping the waves. Whilst the beaches in the north are not quite as powder-like, they are still wide, golden and spectacular, with the added attraction of the beach shacks selling food, drink and trinkets. You need to be cautious of the power of the waves and the currents, but most of the beaches by the bigger hotels operate a flag system with a lifeguard. The colour and vibrancy of the scenery is matched by the warmth and friendliness of the people. As English is commonly spoken, it’s never a problem to ask for directions or for help when out and about, whilst the staff in the hotel bend over backwards to help. 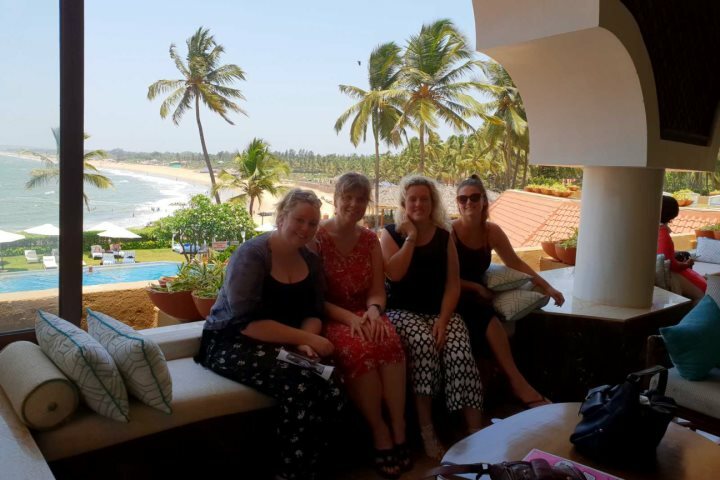 When we visited, at the end of April, there were very few British or European tourists left in the resort, but the hotels were still busy with a large number of domestic tourists from some of the bigger cities of India. They see Goa as an ideal holiday destination where they can let their hair down and relax, as it’s generally more liberal than other parts of India; the majority of men wear western clothes, whilst the women will wear a mixture of western and more traditional garments; you can still be captivated by the sight of an Indian woman in a brightly coloured sari, beautifully decorated with embroidery and gold or silver thread. It’s not unusual for the locals (or the visiting domestic tourists), to want to have their photo taken with you, even at Mumbai Airport (in the early hours of the morning, when you’re waiting for your connecting flight to Goa looking slightly dishevelled!). 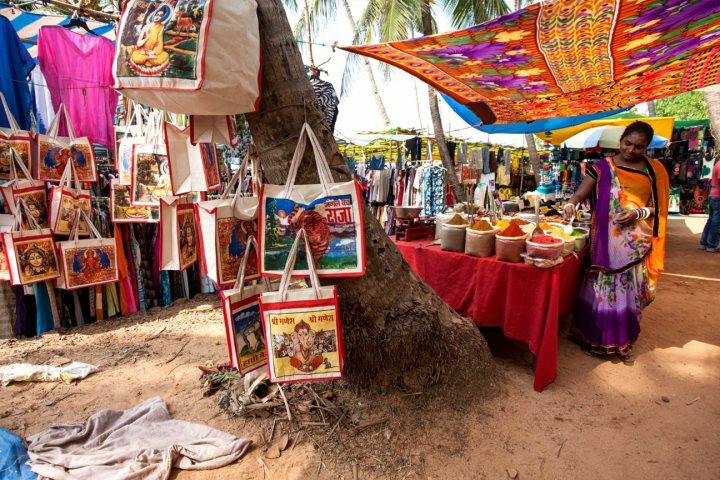 With the heat and relaxed atmosphere, it’s easy to find yourself adopting a more local way of dressing, taking advantage of the many stalls that sell brightly coloured cotton and silk clothing, from harem pants, to embroidered tops, to every shade of pashmina, all at much cheaper prices than back in the UK. 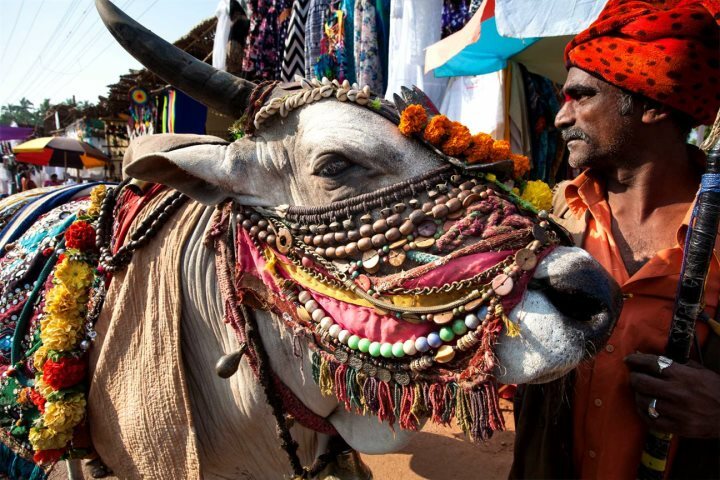 Do take time to visit one of the markets during your stay but be prepared to barter with the stallholders! 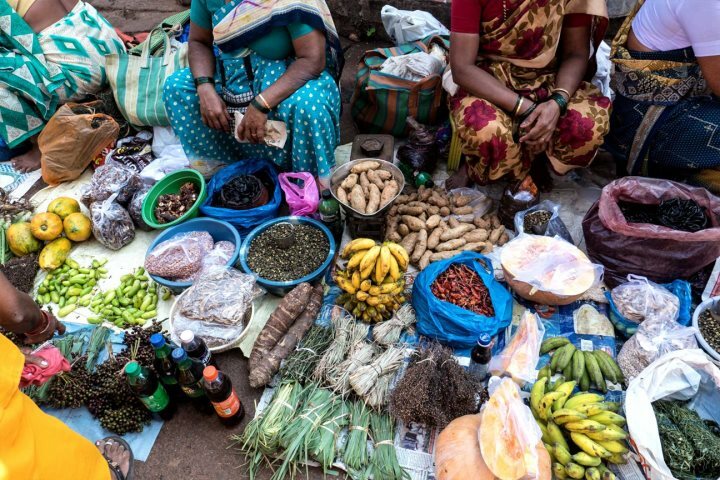 We visited Mapusa market on a Friday, which was more of a local market with a large number of stalls selling fresh produce, spices and household items alongside some of the knick-knacks that would appeal to tourists. We also stopped off at Anjuna during the day (home of the famous hippy market), though not on the main market day, to see some of the stalls which were definitely for the tourists. Be prepared for a little hassle, though if you’re firm and pleasant you won’t have any problems. If something catches your eye, be prepared to barter and you can end up with some great gifts and souvenirs at a fraction of the price that you would pay back home. I left £2 poorer but with a gorgeous silver hair ornament and a jingling silver chain around my ankle! The Saturday night market at Arpora offers a lot more choice with numerous stalls, entertainment and food kiosks and despite being more for tourists, the hassle is less in your face and you can polish up your bartering skills! 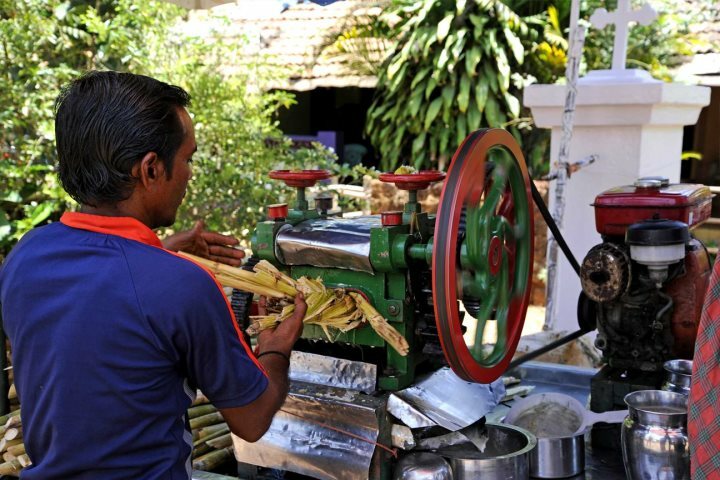 Another thing to look out for whilst in Goa is the fantastic cashew nuts – probably the best I’ve ever eaten! They make a great present for your friends and family or the dog-sitter back home! You can exchange money easily in the hotels, but it’s worth venturing out to a local exchange bureau for a better exchange rate. As an animal lover, being in Goa tugged at my heart strings a little as we did come across several stray dogs. Often seen sleeping on the sides of the roads, they’re obviously as used to it as the locals. They live off the scraps they can find and probably the kindliness of tourists, and whilst I didn’t see any maltreatment at all it certainly made me think how lucky my pampered pooch was at home in the UK. 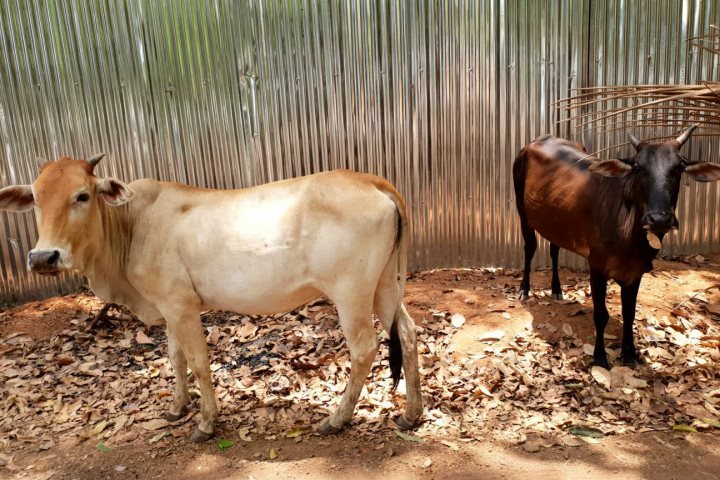 You’ll also get used to the amusing sight of random cows ambling around by themselves, often holding up traffic as they wander across the roads. Occasionally, you’ll see them tethered up in a field where they can happily graze, but they’re also left to meander in the towns to forage for food. They’re quite magnificent creatures and look quite well looked after – apparently, they do belong to someone and their owners will usually round them up later in the day. 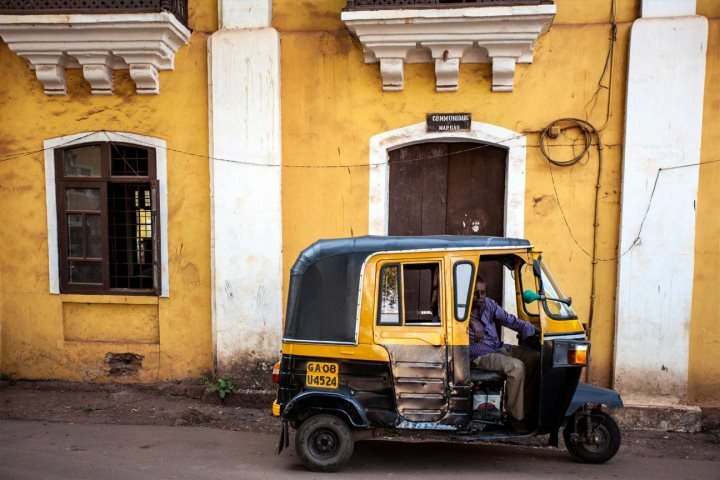 The traffic takes some getting used to and in Goa, it’s a lot quieter on the roads than in some of the big cities, something to remember as you’re sat in the front seat with full view of the road! Every house owns two or three mopeds or scooters, whilst every two or three houses will own a car. The vehicles all look in fairly good condition, which is surprising the way they all weave in and out of each other; road markings, junctions and roundabouts don’t seem to be of any significance with everyone just merging together and vying for position. When crossing the road as a pedestrian it’s a good idea to provide a firm hand signal to stop the traffic (as they won’t stop for you as in the UK). It’s perfectly normal to spot a family of four or five perched on one scooter, with mum holding a baby in her arms (often whilst sitting side-saddle in her sari!) and two little ones jammed in-between her and dad, or perhaps stood up at the front; crash helmets aren’t usually in evidence either! Taxis are a good way to get around and are usually modern, air-conditioned vehicles; you can even ask them to wait at your destination to bring you back. One evening we paid 1500 rupees (about £15) for a 20-minute journey to a local restaurant with two hours’ waiting time before the return journey. The food and drink will certainly appeal to the senses and tantalise the taste buds, though the sight of curry on a breakfast buffet does still take some getting used to! Hotels and restaurants will cater fully for a western palate, but it’s worth trying some of the fantastic local dishes on offer, particularly with the curries and the fantastic seafood, or why not combine the two? Tandoori king and tiger prawns were probably my best meal, so much so I ate them more than once. 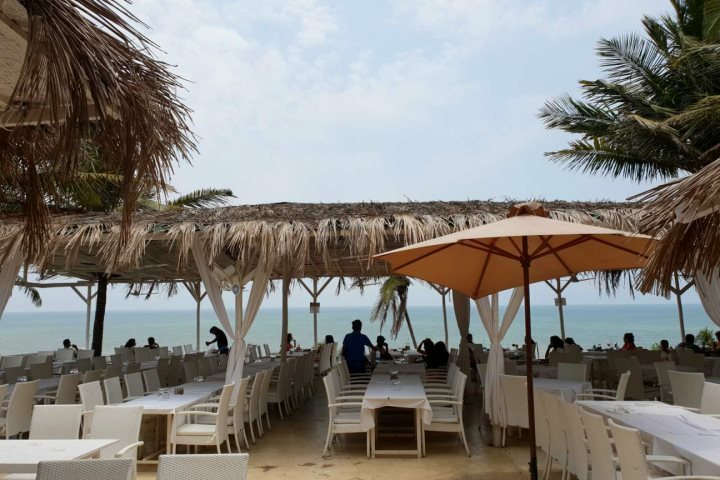 Eating out is so cheap and there are many excellent restaurants to try, a lot of them on the beach, both in and away from the hotels. There’s a wide selection of drinks to choose from too, and it’s easy to keep yourself hydrated with the many fresh juices, spiced iced teas, coconut milk (served out of a freshly cut coconut) and, my personal favourite and staple drink during my visit, lime soda sweet and salty; fresh lime juice and soda water with some sugar and salt to keep you hydrated. There’s also the local Kingfisher beer for the more traditional drinkers. Take the normal precautions with drinking water and where you eat, and you should get through your holiday without an attack of ‘Delhi belly’. A local cure for tummy problems, which you’ll often see on display in a bowl in restaurants are ajwaim (or carom) seeds. They can be eaten as they come, in a multi-coloured, sugar-coated version, or boiled in water and the cooled liquid drunk to help any stomach ailments. Another local cure, though an acquired taste, is kokum juice, a bright red juice that also helps with digestion. There are all sorts of hotels here to suit every size wallet and we were lucky to stay in four different hotels during our stay, ranging from a 2.5 grade to a 5-grade deluxe. All of them were well-equipped with air-conditioning, comfy beds, a good working shower, satellite TV with English channels, a cooling swimming pool (or two) and of course, the vital ingredient, steady Wi-Fi; everyone needs to be able to WhatsApp photos to their nearest and dearest of them lounging on a tropical beach when it’s cold and raining back home! One thing that did seem strange at first but soon became the norm, were the security checks at hotel gates and reception for luggage; usually they would check under the vehicle for anything odd before opening the gate and then your luggage is passed through an airport-style security screening. If anything, it adds to your peace of mind but, in fact, even when walking out and about outside the hotels, you feel perfectly safe, just take extra care when trying to cross the road! Above: chilling at the Taj Fort Aguada. Whilst it’s very easy to spend your entire holiday in the grounds of your hotel or on one of the beautiful beaches, do take some time to get out and about. 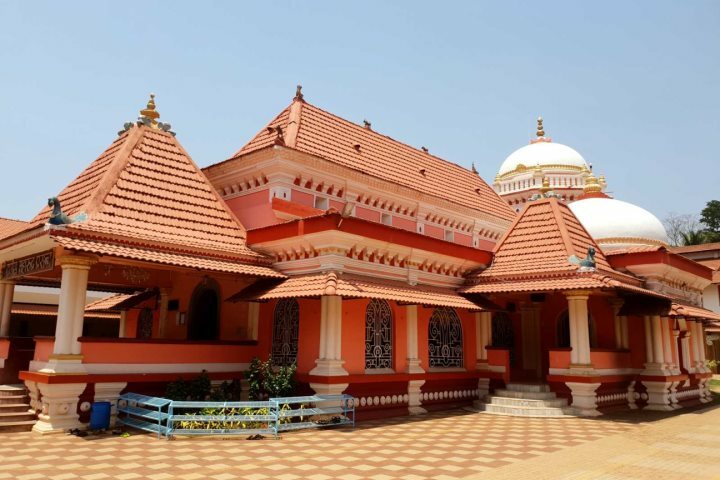 We took an organised tour called ‘Glimpses of Goa’, which gave us a great opportunity to visit Panjim, the capital of Goa, the Shri Mangeshi Temple in Ponda and the Basilica of Bom Jesus and Se Cathedral in Old Goa. 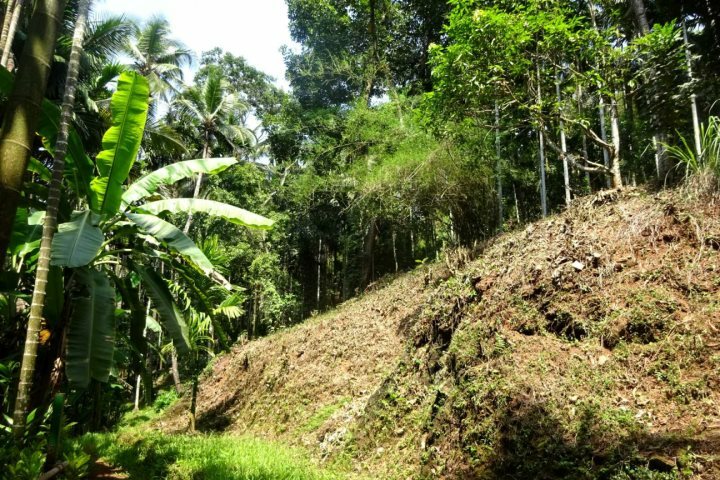 We then continued on to a working spice plantation, where we were greeted with a floral garland around our necks, showered in bright yellow petals and adorned with a ‘bindi’; a red dot between our eyes. After such a unique welcome, we were then shown around the plantation where we were tested on our knowledge of spices using our sense of smell (I think we failed miserably!) before enjoying a wonderful Goan buffet lunch. 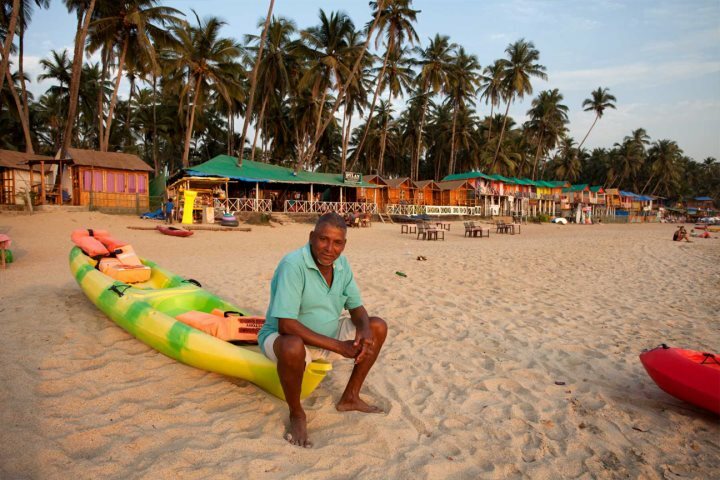 Our private guide, Mario, was fascinating to listen to as he was able to tell us so much about the history and culture of Goa which was linked to his own personal family history. He explained why, as an Indian man he had a Portuguese name and Catholic faith. 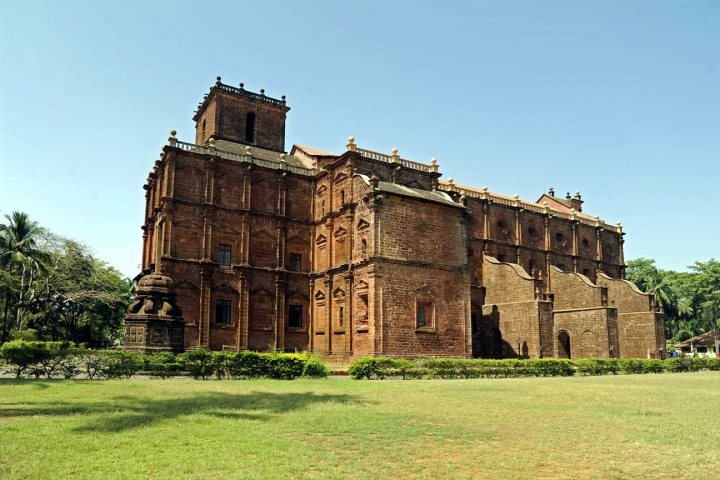 You’ll be surprised at the number of churches you spot in Goa; Catholicism features largely due to Goa’s shared history with Portugal, and some of the churches are pretty spectacular. They all blend in perfectly with the temples and mosques, and Hindus, Catholics and Muslims all live alongside each other peacefully. From the cool interior of an air-conditioned car we were also able to take in the passing scenery and the hubbub of local life. 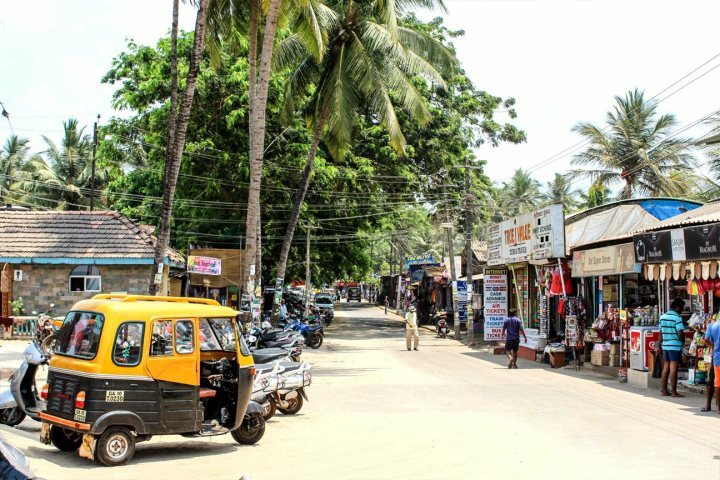 At times it can be loud and brash, particularly more so in the north; there are bright advertising hoardings, often featuring well-known Indian sports stars or Bollywood film stars, and there’s more rubbish along the roadsides than we’re used to at home, but there are also plenty of charming sights to see. We passed several rough cricket grounds, which attracted an audience of people who had pulled up on their scooters to spectate, as well as a Hindu wedding reception taking place when we visited the temple. So, was I as enchanted this time round when visiting Goa? I think I can say I certainly was and would definitely love to go back again (though for a holiday rather than a work trip!). The hotels, food, beaches, scenery and the people were wonderful, and I’m sure I could perfect my bartering skills even more with a little more time and practise. 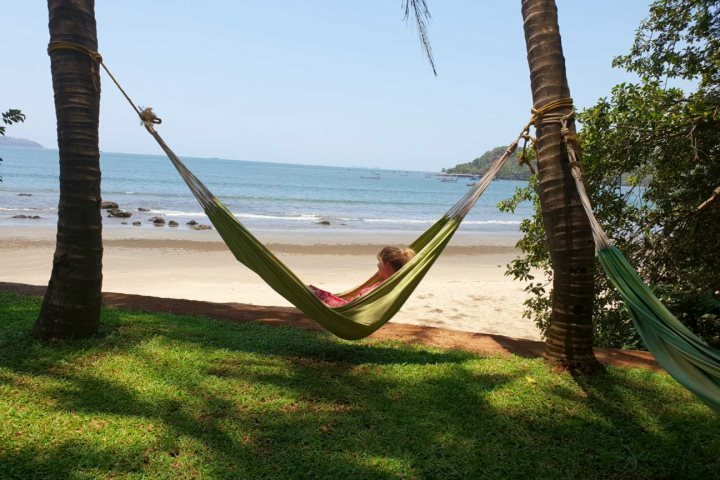 To find out more about embarking on your own holiday to Goa, why not visit our Holiday Ideas, or have a browse of our accommodation collection?